Post Malone was involved in a minor crash early Friday in California, just weeks after he aboard a plane that made an emergency landing in New York, CBS Los Angeles reports. The preliminary investigation revealed no alcohol was involved in the crash. Following the wreck, he joked in a Friday morning post on Twitter, "god must hate me lol". Malone's assistant was driving the Rolls-Royce at the time of the accident. Despite that both vehicles are believed to be totaled, Malone insisted that he was "fine, I'm alright", and authorities did not report any injuries as a result of the accident. Post Malone just can't catch a break! Sgt. 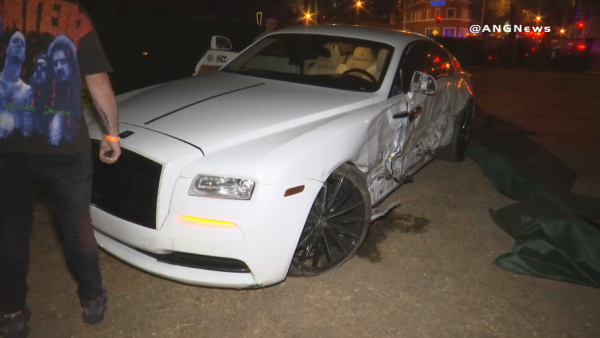 Andrew Meyers of the Beverly Hills Police Department told Billboard that the rapper's Rolls-Royce crashed into a Kia and barreled through a fence before coming to a stop in some shrubs nearby. The jet had taken off from Teterboro airport in New Jersey after the MTV Video Music Awards with 16 people on board when two tyres blew. The crash comes a mere 17 days after Malone's private jet had to make an emergency landing. The Port Authority of NY and New Jersey, which owns the airport, told Fox News on August 21 at the time of the incident that following the tire blow out, the aircraft was supposed to be diverted to Westfield-Barnes Regional Airport in MA. Malone tweeted after the landing, thanking those who offered prayers. The FAA later told Fox News the plane has been diverted to Stewart Airport, located north of New York City. Post Malone had been in the NY area on Monday for the MTV Video Music Awards, where he won the song of the year prize.